“We affirm our allegiance to the European Union and promise to abide by and promote the universal values upon which it is based such as compassion, endeavour, ingenuity, altruism, diligence, daring and a peace-loving commitment to the dignity of all sentient beings, and we are pledged to maintain our citizenship of the European Union for us and for the generations that come after us”. “It really came from being with friends, working out how you put some humour into protesting around Brexit, and that feeling that humour was lacking from the whole thing. We were just chatting, probably over a glass of wine, talking about city states and ‘Passport to Pimlico’. ‘Passport to Pimlico’ is really important in this whole idea, and the idea that you pick up on the humour of that. But then obviously ‘Passport to Pimlico’ is fiction, but Totnes really does have a credible claim for independence because of its links with Troy through Brutus. That was very much just my lying in bed in the middle of the night thinking actually we’ve got a much stronger claim than anyone because we can claim – I know this is the legend of Britain, that Totnes is the new Troy, so of course we’re independent. Of course we’re not part of the United Kingdom, or whatever it would have been 3,000 years ago, whatever it was before the Anglo-Saxons. Totnes has always been the new Troy, so of course we’re independent. That made it even funnier for me. Obviously a lot of that’s been lost in this because that’s a bit too esoteric, but for me it’s an important part of the story. We did consult around the Totnes oath. We sent it round to people to get their views, but when we were drafting it, I was really thinking about what are the values of Troy? What are the values of Totnes? Do they coincide? They seem to coincide. I was really trying to capture that great city state of Troy, that great city state of Totnes. So I suppose that is imagination. Is that imagination or is that being just historical? I don’t know. But I was really trying to capture that essence. Why is Totnes so special? Why does it think in the way that it thinks, and can you link that back to that idea that this is where Troy was recreated 3,000 years ago? You mentioned that the whole Brexit process has been pretty much entirely absent of play, of humour, the imagination. What might it have looked like if a big question like that had been explored in a different way, that had cultivated those qualities, do you think? I don’t want to get overly legalistic now but to call a referendum in the way the referendum was called, where you’re just asking people an abstract idea … You know, what did voting to leave the EU mean to people who voted to leave the EU? You’re making your decision to leave – I’m not taking away their importance – but you’re making a decision on things that aren’t directly relevant. For me the best analogy is what was going on in 1913 and the run up to the First World War, where the idea was that it would all be over by Christmas, and it was this sort of delusional patriotic moment where people were, “Yeah, yeah, let’s prove that Britain is best” and obviously that meant that we went into this disastrous war that we haven’t ever recovered from. The trauma that people must have lived for the rest of their lives, who were part of that, must have been terrible, and very, very significant. And it feels the same idea. Obviously things will continue after Brexit. I imagine the UK will break up. I imagine Scotland will leave. It will be a different country. It will be a different place, and England will be poorer, inevitably. And it is quite an interesting idea then to get a bit more serious again and maybe this is about imagination as well. City states are great. City states in a federation were a really nice way of governing, of running the world. If you look at the pre-unification Germany where it was built up of city states –obviously there were deeply flawed aspects of it because it was virtually feudal in many respects, but they do work. You can imagine a very, very successful Totnes City state within the European Union. Now I’m being serious but you can imagine that, and I would want to live in that city state. I doubt it. 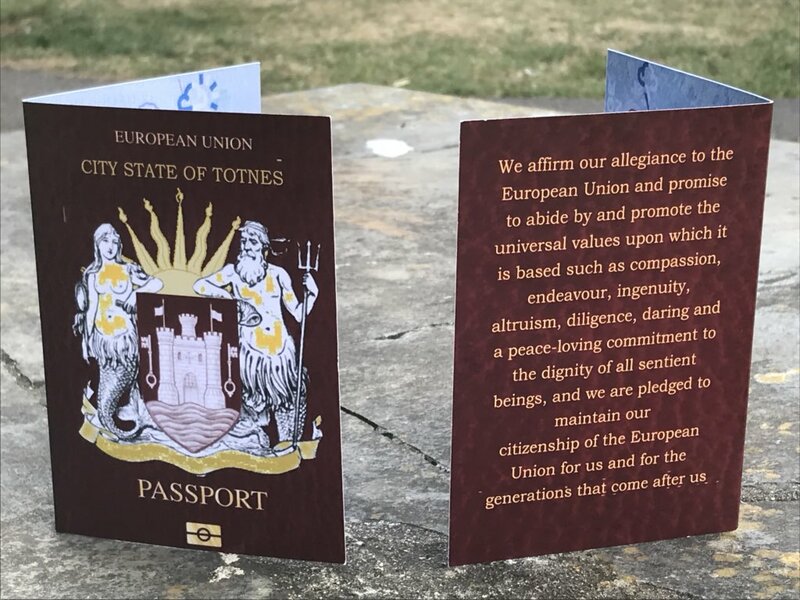 I’ve created a whole fictional case, where the city state of Totnes takes the United Kingdom to the International Court of Justice, and obviously we win – playing on ‘Passport to Pimlico’ – we win the case establishing that we are Troy but legally I can’t see how it would be possible. I have written to Michel Barnier saying I hope you’ll recognise it – well, I’ve tweeted Michel Barnier, let’s not get carried away. I don’t make the effort of writing. Obviously he hasn’t replied. But to be honest it’s got so much coverage in Europe at the moment it will be interesting to see what they do do with it. So what has been the reaction to this? We were going to launch at Totnes Cinema with a screening of Passport to Pimlico. And we were going to have a bit of music and a bit of fun as well. We’d come up with a European playlist which is really great. Best party songs imaginable. A lot of Europop obviously. Not much Abba, but a little bit. But I got rushed to hospital with sepsis at 4am that morning, so I couldn’t go. They still screened the film and they still did something but we didn’t launch the passport. When I was better, interestingly the media were contacting me about it and I just asked them their view. I mean maybe to ask the media’s opinion is not a good idea, but I just said, “Should we go ahead with this, without an event?” And they said if you’re going to do it, you should do it. So we just literally did it here, at Totnes Guildhall. 5 people turned up. Not like now. Literally 5 people turned up and it was all a bit embarrassing. The BBC was here and some other national journalist was here, and the Independent were here. I probably still had the vestiges of sepsis, but I’m glad we did it because if you’re going to do it, you just have to do it. How many have been given out so far? Over 500 hundred. And we’re sending them out too. Obviously this thing that I thought would be a 100, we certainly weren’t going to charge for it. You can’t charge for it. It was like, “It’s fine. It’s like buying a hundred people a cup of tea, it’s fine, I can do that.” But now we’ve spent a lot of money on it. So we will put a donate button on our Facebook page so people can donate if they want to. And then if there’s anything left over we’ll give it to People’s Vote. It’s a bit of fun and it’s not protest. I can’t quite get the right word for it. Maybe you can help? It is a form of protest. In that way that creative protest is always the most effective. But it’s not quite protest. I see protest as doing something a bit more direct. It’s like fierce play. I think of it as something like that. I agree. Something like that. But it’s serious. The Totnes Passport issuing department. I always have that with Transition. You start a small thing, like the Totnes Pound or something; you start a local currency project. People say it’s not going to change anything. But then actually you see how ideas spread and they mutate. Like microbiology. If people all across the country, if every town and city issued its own passport, how could it start to shift things before March, do you think? I’m praying for it. If everyone did it, and they all said “we’re not going, we’re not leaving”. You know, I sort of feel we’re not leaving. I’m not going to leave. They can’t do this. There is no mandate. They got 37% of the registered vote. There is no mandate. To get a bit legalistic about it, a normal referendum would put in threshold safeguards. For example if there was a referendum on should we keep the monarchy, would we get rid of the monarchy on 37% of the vote? I don’t think we would. Or the death penalty. Would you reintroduce the death penalty on 37% of the vote? I don’t think we would. Why did David Cameron not just say, “Right, that was a wake-up call but 37% is not a mandate to leave. We need to work out how we do this again.” It’s as if a madness descended on everyone. Obviously maybe this is the way of doing non-violent direct action. Maybe this is the way of doing it. Maybe this is our Gandhi moment, our Martin Luther King moment, where Plymouth does the same. I tweet, email people. If the City of London did it, if business said we’re not leaving, they had a sense of humour just to say, “We’re not going”… All those banks, “No, we’re not leaving, we’re staying.” The Brexit project would just grind to a halt. What sort of reactions have you had from people while you’ve been sitting at the table in the rain? I liked the guy who was on the BBC piece who was a Brexiteer, who said something like, “Well, it’s funny” or something, because it’s polarised people so much and everybody sees the people in the other camp as being humourless. That’s why the Totnes Pulse piece was so good. Have you seen it yet? It’s really good. They change the original French version of ‘Passport to Pimlico’, from 1949 or 1950, they change it to ‘Passport to Totnes’, but it’s all in French. It’s very clever. It’s really clever. And they do a very good video, really upbeat video. Because it was David Cameron? That is a problem with the Tories. The Tories have a problem in bigging up the EU because what they always want to refer to as the ‘Thatcher economic miracle’ – I’m not even such a thing even existed – but the reason why the UK economy got back on track was because we had joined the European Union and the British had created the single market. It was the Brits that created the single market. Not the other Europeans. We created it in order for the British service industry in particular to benefit from – well I don’t know how big it was in those days – but the equivalent of 500 million insurance claims, bank accounts. That’s why we pushed to create the single market. It was a British invention. So was it a Thatcherite economic miracle, or was it joining the EEC that lead to that miracle? It was joining the EEC. It was despite Thatcherism that we succeeded, because of membership of the EU. And it happens with every country that’s joined. Within about 5-7 years, they have this growth. You know, a 6-7% growth spurt. It’s happening now in Romania and Bulgaria. “Proud member of the European Union”. Rob, where can I get mine? And where can I donate towards the cost? Me and my family would be proud to have a passport from you and of course we would like to visit our new home. Is this passport available for those of us outside of Totnes? I fully sign up to the sentiments expressed in the Oath.